Following divorce, a spouse is using the child as a weapon of revenge and retaliation against the other spouse-and-parent in the divorce, in order to inflict severe emotional abuse and the psychological trauma of losing their child on this targeted spouse-and-parent. This pathology is a form of domestic violence (Intimate Partner Violence; IPV), the emotional abuse of the ex-spouse using the child as a weapon of spousal revenge and retaliation for the divorce, and in the process psychologically abusing the child by creating severe pathology in the child. The clinical psychology legal argument package is grounded on a different set of constructs from professional psychology (Bowlby; Minuchin; Beck) than is the forensic psychology argument package (arbitrary and unknown foundations), and the clinical psychology option seeks a different remedy from the Court than the forensic psychology argument package. The task of each parent then becomes proving their position regarding the child’s rejection of a parent to the child custody evaluator, who will decide on the “evidence” presented to the custody evaluator on the relative merits of each party’s position, and will decide on the custody and visitation schedule for the family – thereby ABROGATING the duties of the judge… to hear argument and evidence, to make a determination of fact, and to render a decision regarding the custody visitation schedule. Custody and visitation decision-making has essentially been assigned out of the courts and to forensic psychology, and the only approach available from forensic psychology is an invalid (no inter-rater reliability) six- to nine-month forensic child custody evaluation costing between $20,000 to $40,000. Each parent tries to influence the custody evaluator to their position. The position of the allied parent (supported by the child) is that the targeted parent is “abusive” and “deserves to be rejected: by the child. The position of the targeted parent is that the child’s attitudes and behavior is being influenced and controlled by the allied parent as a means to inflict emotional suffering on the targeted parent for the divorce (that the child is being used as a weapon of spousal revenge and retaliation for the divorce). Counter-transference (unconscious bias) from the psychologist ALWAYS exists, in all cases, in all contents. The introduction of the psychologists own unconscious biases are identified as “schemas” in professional psychology. Personal biases in the assessment of information is always present, and is entirely unconscious to the person. This is a fact of psychology, and of all assessment processes. In the forensic psychology process, the custody evaluator acts as the “judge” regarding the relative arguments offered by each parent, and they custody evaluator makes a determination of fact – typically whether a poorly defined construct called “parental alienation” is present and to what degree – and decides on the remedy based in the child’s custody visitation schedule with each parent. The focus on the treatment of family pathology, on the other hand, will move this into clinical psychology and a clinical psychology assessment of pathology. The targeted parent, on the other hand, will present the court with the “influenced child” argument surrounding the child’s refusal of contact, and the targeted parent will seek the remedy of limiting and restricting the the child’s time with the allied and “favored” in order to resolve the “influenced child” refusal of the court-ordered custody and visitation. 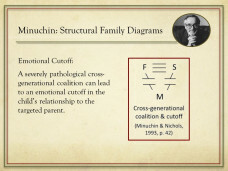 The clinical psychology argument package adjusts both the focus (treatment of family pathology rather than child custody schedules) the the framing for how the “influenced child” argument is presented to the court. Of note is that the clinical psychology argument package to the court will not be using the personality disorder information sets from professional psychology in the argument presented to the court. The personality pathology information from professional psychology will emerge over time within the broader background understanding within the legal and mental health systems form gradually increasing familiarity with the pathology. Clinical Psychology: The clinical psychology orientation is to move the family conflict out of forensic psychology that offers no solution and over to the clinical psychology for the identification (diagnosis) and treatment of the (“high-conflict”) pathology in the family. If the child is indeed being “victimized” by the “abusive” parent (thereby justifying the child’s reluctance to be with the rejected parent) as is alleged by the allied parent and child, then a trauma-informed, treatment focused assessment from clinical psychology is just the assessment to identify this child “abuse” and “victimization” of the child by the targeted parent. The narcissistic-borderline parent is using (exploiting) the child’s induced pathology (the child’s rejection of a mother or father) to make the issue about child custody (“possession” of the child following divorce; who’s the “better parent” that “deserves” possession of the child). The targeted parent is using the child’s pathology created by the other parent to make the issue about the diagnosis and treatment of pathology. Since both agree on the existence of pathology, just not its causal source, a clinical psychology assessment and diagnosis, with treatment implications, is entirely warranted as the initial remedy for both arguments. Let’s find out what’s causing the child’s attachment-related pathology following the divorce – that’s a clinical psychology issue – identifying pathology is called diagnosis. The other party will likely argue against this clinical psychology assessment. The rebuttal to this argument that can be offered by the attorney for the targeted parent is “second opinion”; that the opposing party is free to obtain a second opinion, a second trauma-informed clinical psychology assessment of the complex family conflict. That is the framing for the clinical psychology legal argument package. In all cases of child abuse, physical child abuse, sexual child abuse, and psychological child abuse, the professional standard of practice and duty to protect requires the child’s protective separation from the abusive parent. The child’s healthy development is then recovered and restored, and once stabilized, contact with the formerly abusive parent is reestablished with sufficient safeguards to ensure that the child abuse does not resume once contact is restored.